In the spring of 2005 the LAMI Brigantine "Irving Johnson" ran aground coming into harbor. The next few days and nights volunteers heroically came to the aid of the stricken vessel and did all they possibly could to get this majestic ship off the beach and back to sea. Their efforts were not in vain, within a few days the "Irving Johnson" was off the beach and in a local boatyard so damage could be surveyed and preparations for repair and refit could be done. By June the "Irving Johnson" had been moved to Gambol Industries, Inc. boatyard in Long Beach and the process of repair and restoration had begun. The Twin Brigantines "Irving Johnson" and "Exy Johnson" project began with the establishment of a design team in May of 1997. The vessels were to have the character and semblance of commercial vessels from the turn of the century era. A main aspect of this project was to have a large body of relatively unskilled volunteers building these twins and to build them at the waterfront location of the Los Angels Maritime Museum thus encouraging the public to come view and participate in the construction. The vessels have been designed and built to last through the next century. Click on the following link to find more information on these vessels and the Los Angeles Maritime Institute (LAMI). The sister ships "Irving Johnson" and "Exy Johnson" are so named as a tribute to the famed couple, Irving & Electa Johnson. This couple met aboard the sailing vessel "Wander Bird" in 1931 and married in Sept. of 1932. After their honeymoon they began plans to circumnavigate the globe in a sailing vessel of their own. They wanted the majority of their crew to be young amateurs with a couple of experienced mates. The vessel they desired would be a North Seas pilot boat, superbly seaworthy and comfortable. Eventually they found their first vessel in Ipswich, England, the "Texel" with a length of 92' and beam of 21' and draft of 11'. The Johnson's renamed their vessel the "Yankee" and changed it registry from British to American. After making modifications and giving their vessel a new coat of paint in Hamburg, the Johnson's made the "Yankee's" maiden voyage to its new homeport of Gloucester. On November 5, 1933 clearing Gloucester harbor the Johnson', their fresh crew and the "Yankee" began their first global circumnavigation. Eventually the couple would circumnavigate the globe seven times and sail the canals and waterways of Europe in three different vessels (all named "Yankee") with inexperienced crews. Irving McClure Johnson was born on July 4, 1905. In his teenage years he began training for a sailor's life. He began his mariner career in both the Merchant Marines and as a private yacht captain during the summer months. Early in his career he worked as Captain on board the "Squaw" (a New York 40), the "Charmian" (a 70' Seawanhaka). In 1926 he joined the Merchant Marine and signed on as a quartermaster on the "S.S. Santa Teresa" (a 360' passenger steamer). In 1927 he signed on as a cadet on the "U.S.S. President Wilson" and made his first global circumnavigation. He then went and sailed on the "R.M.S. Aquitania", which left him in Europe. He then set sail on the barque "Peking" in late November 1929 and made an amateur film documenting his trip entitled "Around Cape Horn". In 1930 he was First Mate on board the "Shamrock V" during an exciting voyage across the Atlantic. His last job was as mate on the "Wander Bird" and met his future wife Electa Search. Irving and Electa (Exy) had two sons while circumnavigating the globe on the "Yankee", both sons learned to walk on decks of the "Yankee" while the family sailed the oceans. In the summer of 1941 Irving joined the U.S. Navy and was at Pearl Harbor during the infamous December 7 attack. Captain Johnson's expertise of the South Seas made him a natural choice for identifying and planning bases in the South Pacific. He was later assigned to the "U.S.S. Sumner" naval survey ship, which charted and blasted channels through coral reefs throughout the Pacific in advance of the U.S. Fleet. The "Yankee" was sold to the Admiral Billard Academy at the beginning of the war. 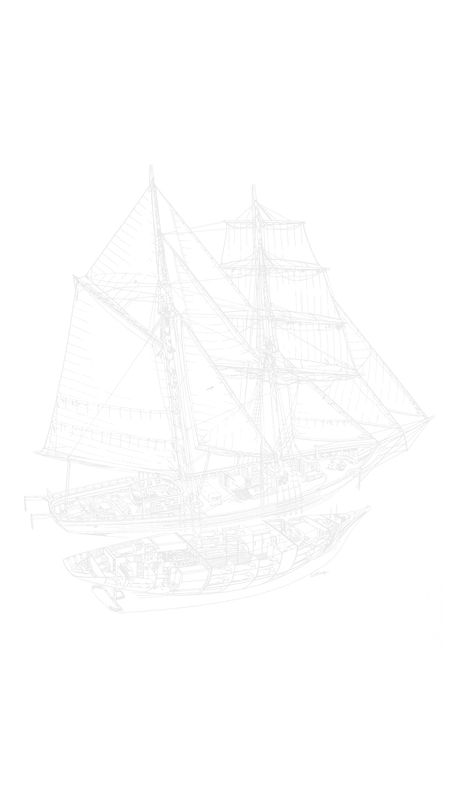 After the war, the Johnson's purchased the German schooner the "Duhnen", a steel vessel with an overall length of 96' and draft of 11'. The "Duhnen" had been confiscated by the British at the end of the war, the Johnson's in turn, purchased it from the British and had the "Duhnen" refitted and renamed the "Yankee". Between 1947 and 1958 the Johnsons made four more global trips in this vessel. 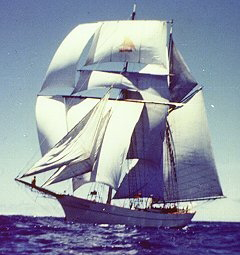 In 1959 the third "Yankee" a 50' steel centerboard Ketch with shallow draft, was designed by Irving Johnson and Olin Stephens and built by Scheepswerf, Westhaven, Zaandam Holland. The Johnsons spent their retirement years sailing it throughout Europe. Below are links to websites of some of the vessels that Irving Johnson served aboard. Below are links to websites in which the summary of the Johnsons history is derived from.